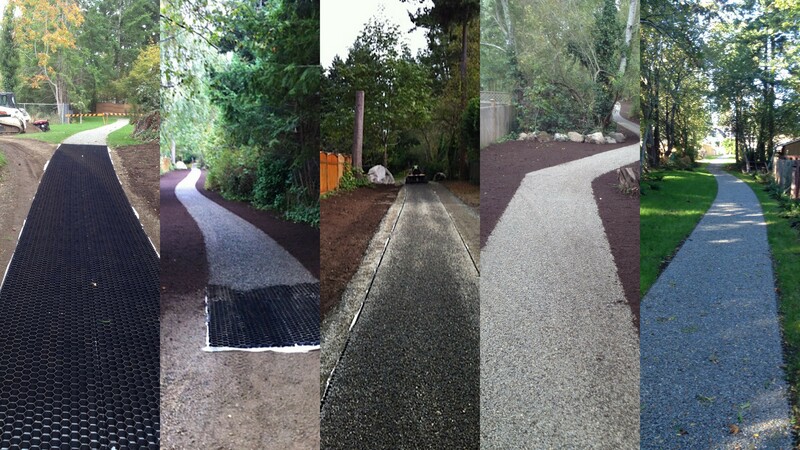 Gravel Paving | K & L Design L.L.C. CORE Gravel™ is a gravel stabilizing system that consists of a foundation of connected honeycomb-celled panels with a geotextile backing. Once filled with gravel this system is ideal for vehicle or pedestrian traffic with no compromise in strength and durability. This eco-friendly system costs less than asphalt, concrete or block pavers. CORE Gravel™ solves the problems associated with loose gravel; sinking, migrating and forming ruts. This is a proven solution for hassle-free gravel paving for all types of vehicle or pedestrian traffic with no compromise in strength and durability. The underside incorporates a durable geotextile which is heat welded to each cell, allowing water to drain easily while preventing weed growth. All panel edges have an interlocking system that makes for easy installation, even on steep grades. Made with either 100% recycled PP (polypropylene, black or green) or recyclable PP material (white or gray).